I am struggling with how to begin this week’s forecast. I know I want to write about the changes that white Americans need to make to end racism and white supremacy, but I don’t know how to dive in. That in itself is a pattern, isn’t it? Many white Americans are frozen in inaction because they don’t know how to dive in. I am frozen in inaction because I don’t know how to dive in. So, I will dive in. I suspect it will take many times before this diving feels more natural. Don’t stop reading. The astrology of the moment plays into this. But first. We have a problem. White Americans have a problem. I am not a scholar or expert in racial justice activism or education. I’m just an awakening person who can’t turn away from the reality that there is a lot wrong with our country and much of it is centered on race. White people need to make fundamental changes in the way we see the world. A few years ago, I took a life-changing workshop—More Than Skin Deep: Uprooting White Supremacy One Cell at a Time—taught by Susan Raffo and Heather Hackman. (I’d like to recommend something that Susan Raffo wrote about whiteness for those new to the idea.) I learned about whiteness in that training. I learned that whiteness is the system, almost a moral code, which perpetuates privilege for a select few and exploits the rest. I learned that as a white person, I have been fed stories that help maintain this system. Some of these stories feel like goodness and solid values, yet end up being the means of justifying oppression of others. I learned that undoing these stories will take more than a lifetime, and so, I better get to work because a world without racism is a world worth manifesting, however hard it will be to get there. Undoing the stories that perpetuate injustice and oppression. This is where the astrology comes in. It is not surprising to astrologers that we are in our current crises in the U.S. In fact, astrologers think it will get worse over the next five years leading up to a significant transit in 2022. In that year, Pluto returns for the first time to the degree where it was when the country was born. Till that time, unexplored shadows—Pluto’s realm—will continue to emerge as part of a dying/rebirthing process. There is a lot to hope for in this transit and a lot to become aware of. Toxic stories are revealed and composted so that life-affirming stories can be told. The recent eclipse, visible across the entire continental U.S. is a part of this process. This lunar cycle, which began on the cusp between Leo and Virgo, is part of this process. Right now is part of this process. I like to start in the moment—the first quarter phase of this lunar cycle. I think of this as the Warrior Phase. During the first quarter, challenges to our intentions arise. We must meet them with determination. These challenges help define our desires. We hone and refine the vision that may have felt foggy under the New Moon. Since this New Moon was an eclipse, we really had no way of knowing just what would come from the sudden darkness and light’s return. There is a high level of uncertainty under an eclipse; we just know something will happen. Something is. Something will. 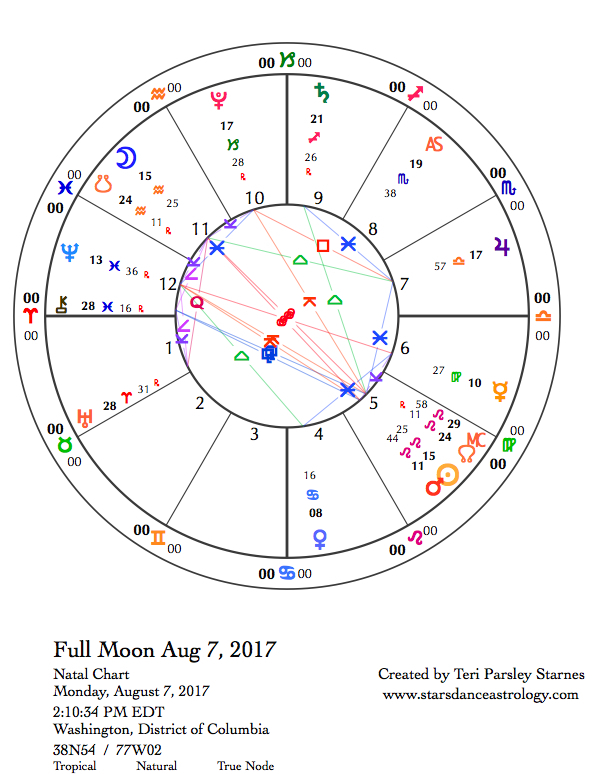 This week Mercury, Mars, and Uranus (by trine) will activate the eclipse degree. This transition to new information, symbolized by the eclipse, continues to unfold. You may notice that your intentions have shifted suddenly. You may notice that what felt foggy is getting clearer. It will continue to do so. I am still processing in my body the experience of witnessing a total eclipse of the Sun. It was powerful. I keep thinking about the Moon’s shadow moving across both the Earth and my skin. I keep thinking about how the shadow itself felt like a being or an animal. I keep thinking that this shadow, not at all toxic, but a blessing, was offering my soul a fresh start. I keep thinking this offering is the magic of this lunar cycle, eclipse cycle, and whatever other cycle we want to include because it is just that big. Shadows can hurt when they come out of hiding, but they also can save us. And that is why I want us to think big right now. Why I am trying to think big right now about the new stories I want to tell. Virgo is a sign of purification. It is so tricky for a white person to talk about purity. Whiteness stories have corrupted the beauty of purification. Perhaps if we go back to the Greek stories of women bathing in a certain cove in the sea in order to renew their virginity, we can come close to what Virgo is about. This is priestess energy. This is belief that we can be washed, not white-washed, but returned to the fold as part of nature again. My heart longs for this. I may not know the way, but the Moon’s shadow says yes to that desire. This Virgo mission is tinged with Leo life force. The Sun rules Leo. Right before the Sun was eclipsed, when just the barest part of it was visible, the world was still bright, eerily bright but bright. We know this Sun of ours, even when we take it for granted. When the Sun I know left the sky for only two minutes, I felt as if I had been transported to another planet in another solar system. This couldn’t be my planet. After just a moment with the Moon shadow, it was as if a switch was turned back on. Everything returned quickly to a familiar light. Did that just happen? My rapidly beating heart told me, yes. The Sun is an anchor. I now have a better sense of why the Sun is worshipped and what we miss by forgetting our own solar essences. All this brings me back to whiteness and the message of the eclipse. All people hold the life force essence of the Sun within their beating hearts. We are all sparks and particles of light. As sparks of light from this amazing star in the middle of our solar system, we deserve better than this life-hating system of injustice and oppression that is white supremacy. The Moon shadow is a challenge and a gift. Remember this spark. As a Virgo priestess, dedicate yourself to serving it. At this first quarter phase, fight against the forces that want to take this spark from you and keep the toxic stories alive. As a person trying to wake up, stay tuned to more, and find ways to align the vision with the energy. And then dive in. August 29—First Quarter Moon: Sprouting. We are putting together the big picture. What does it mean? The Moon in philosophical Sagittarius makes a square aspect to Neptune in Pisces. Perhaps there is a temptation to bypass the real work and drift into a feel-good version of spirituality. The world is crying for us to pay attention. People are suffering in Texas right now. We don’t need to save everyone, just do what we can. The sextile aspect between Jupiter in Libra and Saturn in Sagittarius will be in effect for the next few days. This helps ground us in the possible without giving up on the dream. What is your dream? What is your work? Wednesday, August 30. The Moon conjoins Saturn in Sagittarius and makes a sextile to Jupiter in Libra reinforcing this very productive aspect between Saturn and Jupiter. And we need all the productivity we can get. This collaboration between Saturn and Jupiter is helping us put together the pieces that have been floating around for a while now. Truth and meaning are not all that relative after all. As Trump continues to dismantle institutions of knowledge, we realize the value of facts. With this knowledge in hand, Jupiter says believe in the elegant solutions, go for balance and justice, and weigh your choices with the added benefit of facts. It helps! Later in the day, this fiery Moon makes a grand fire trine with Mars in Leo and Uranus in Aries. This will not be a restful evening, but perhaps an inspiring one. Thursday, August 31. We might be more tuned into authority as the Moon moves into Capricorn. Who gets to have authority? Who deserves it? How do we keep leadership accountable? What do we need from our leaders? Capricorn’s eye is on the bottom line. Sometimes this feels like how much money we make, but Capricorn’s bottom line is ultimately about helping the community/family/clan survive hard times. Hard times are here for many people in Texas and around the world. What do we need from our authorities? Mercury continues to retrograde. It started in Virgo and re-enters Leo today. Mercury is the weaver of meaning. Mercury is weaving together the link between Virgo service and Leo life force. Find the sustenance for your service that comes from life itself. Friday, September 1. We might notice weariness from emotional overload today. Mars in Leo makes a paradoxical quincunx aspect to Chiron in Pisces. We could notice the frustration that comes from not being able to solve the problems. No amount of heroic action is enough. If we surrender this fantasy, what new approaches offer themselves to us? The Moon in Capricorn can be stoic. Don’t let that energy keep you from feeling your feelings until they’re done. Later we can build our way out. As the Moon conjoins Pluto and squares Jupiter in Libra, we may be overwhelmed by fears, too. What/who is your anchor? Reach out if you are overwhelmed. September 2—Gibbous Moon: Budding. This lunar cycle began with a powerful solar eclipse at 28 degrees Leo (near the end of Leo and beginning of Virgo). This degree is now charged with the eclipse energy. Today Mars moves into 28 Leo while at the same time making a trine to Uranus at 28 degrees Aries. The Moon’s square to Uranus today only adds to the electrical charge built up by these positions. We could see another aspect of the eclipse today. This may occur through unexpected natural, political, or personal events. It is as if the tide is moving us along. Mars can be impulsive and it can by dynamic and forceful. Mars in Leo is the champion of the life force. Uranus is the awakener and the disrupter. A trine is an unchallenged flow between the planets. This may feel like too much energy for some of us. The gibbous phase of the Moon carries its own tension too. We feel we are on the cusp of realizing or attaining our desire but we still need to stay committed to see it through. Mars and Uranus might help to give us an added boost of energy. I am speaking to those who have taken on active roles to change the world, Remember your dedication (Virgo). Remember you come from a star (Leo). Remember we need you. Sunday, September 3. We are not done with eclipse triggers. Today Mercury (retrograde) reaches 28 degrees Leo (eclipse degree) and conjoins Mars at the same degree. During the eclipse, when the stars popped out in the middle of the day, we could see Mercury and Mars on either side of the Sun. The Sun has moved on, but Mars and Mercury meet at the place the Sun stood during the eclipse. How cool is that? My astrologer mind is quickly wondering, what does it mean? I may not know right now, but I know it means something. And today we might find out. Mercury is the messenger. Mars is the questing hero. Mercury is the weaver. Mars is the lover. Mercury is mind. Mars is will. Events have a fated quality. We can’t control every outcome, but perhaps we are meant to throw ourselves completely into the desire of outcome anyway. Control is a small desire. What is the bigger one? We are feeling visionary and revolutionary with the Moon in Aquarius. Monday, September 4. Labor Day. Let’s give thanks to the labor movement. We may need to draw upon their experiences as we learn to act collectively again. The Moon in Aquarius is ready to start the revolution right now. Both Saturn in Sagittarius and Jupiter in Libra are willing to let go of naysaying and inflation. Perhaps there is hope. But we can’t forget it will take effort—long effort to bring about healing and right relationship. The Sun in Virgo opposes Neptune in Pisces. Perhaps we see this opposition in play in Texas as workers and volunteers (Virgo) work to help those who have been inundated by the water (Pisces). We need to believe and we need to be pragmatic. This opposition helps us integrate and ground our ideals and re-inspire our acts of service with visions of healing. Tuesday, September 5. 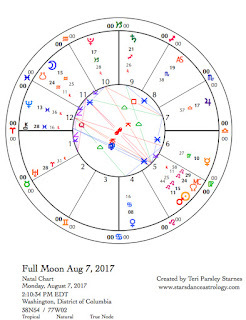 Mercury stations direct on the eclipse degree today. Will another shoe drop? What more is there? If Mercury has been broadcasting one message since turning retrograde on August 12, what do you think it has been? Don’t try to overthink this. So far, this lunar cycle has not been subtle. Even though the Moon in Pisces, along with the Sun opposite Neptune, may confuse the linear, rational way of approaching things, that doesn’t mean the message isn’t clear. Listen for it and let it guide you. Be especially attuned to your intuition. Be ready to take action too. Mars, the action planet, moves into Virgo, the sign of service and devotion. There is a reason our shadows have been revealed to us at this time. Take it as an opportunity to start again. There is complexity woven into the day. Venus in Leo makes a puzzling quincunx to Neptune in Pisces. There are a lot of influences today encouraging us to be selfless. We can take that too far. Venus is here is remind us to be fabulous as well. Enough said. About these forecasts: Through following the Moon, the planets, and the wisdom of the seasons and signs, my goal is to offer a useful practice of mindfulness and intention for the thoughtful seeker. To read about the beginning of this lunar cycle, go to my website. The lunar cycle that began on July 23 is preparation for the next lunar cycle that begins with a bang on August 21. The Sun, Moon, and Earth will align in such a way on the 21st that there will be a total solar eclipse. This last week of the current lunar cycle is a chance to reflect on what is in our hearts—what prayers, magic, actions we intend to send into the cauldron of the next New Moon. A powerful opportunity is brewing, fueled by out of the ordinary coincidences. The heavens have cooperated by giving us two Leo New Moons in a row. This is not a rare occurrence but it is out of the ordinary. An eclipse is not a rare occurrence, but the length of time if spends over land, visible to this many people, is out of the ordinary. That this eclipse is visible in the United States, a country at a crossroads and in crisis, is not rare but it is significant. That Mercury is moving retrograde now until September 5 when it will turn direct at the same degree where the solar eclipse occurred is not rare, but it definitely out of the ordinary. It is time to pay attention. Now, we get to the core. Now, we look into our hearts. This lunar cycle in Leo marks a powerful moment to align with core values and to courageously stand by the values that support life. Leo is the fixed fire sign. Each of the fixed signs, Leo, Scorpio, Aquarius, and Taurus, has a special place. These signs anchor the wheel of the year. These signs anchor the elemental powers associated with them. These signs are gateways to essential values. Each is core. The word “core” is related to “courage.” Both come from the root word for heart. Each fixed sign represents the heart of an element and season, but Leo perhaps even more so. Leo the Lion, ruled by the Sun, represents the heart of courage. As solar force, this sign represents the core essence of who we are and what we stand for. This solar force is the spark of life that allows us to give and receive. This spark is how we know we are alive and connected to the web of life. Core and courage. I write from a perspective of someone living in the United States. I am also white, female, and from a middle class background. My point of view is not universal. I am grateful that other points of view are represented in the world of astrology. We need those other voices. Yet, from my perspective, the solar eclipse and the remainder of this lunar cycle has a lot to do with the crossroads the U.S. finds itself at. There is a lot going wrong. Just yesterday, white supremacists marched in Charlottesville, Virginia. The President of this country is engaged in nuclear bomb taunts with North Korea. The Earth is being threatened by pipelines and walls. And that is just some of it. As a friend recently said, if you aren’t stressed out right now, you aren’t paying attention. Eclipses are magical. They are metaphors for sudden revelations and potent moments for intentional acts of magic and prayer. This moment is an opportunity. Now is the time to activate our cores and our courage. Magical acts are powerful anchors for change. I know this. We need this. During the final days of this lunar cycle, remind yourself of your core and your courage. Let us not forget we each have life force to give and receive. We activate the web of connection when we remember who we are. August 14—Last Quarter Moon: Reseeding. At this phase of a lunar cycle, we have the opportunity to reseed our intentions based on the experiences we’ve had so far during the cycle. At the New Moon on July 23, I planted the seeds of knowing my right size, neither isolating into inflation about my personal significance nor diminishing the contributions I make to the web of connection. Knowing this state, I am able to share and receive gifts of life force. At this point in the lunar cycle, I want to move past the awareness of my “right size” into feeding the vital hopes and dreams that support life itself. The work of this cycle has prepared us to make a leap. What have you reaped in this lunar cycle? What are you called to feed with this harvest? Let the Moon in fixed earth, Taurus, help you ground and anchor your intentions. Our bodies help us know not only what is really important but how to sustain our efforts through patience and commitment. Look for the most solid things in your life. Feed them with gratitude and listen to what they tell you right now. Mercury is moving retrograde in another earth sign, Virgo. We are being told to slow down. Not give up. The more we push against this message, the more likely we will experience Mercury’s mishaps. The Sun and Mars in Leo may try to fool us into rapid responses. We might feel anxious about a slower pace of action. Those who are not reflecting on the long haul will burn out under this influence. Take good care of yourself. Tuesday, August 15. It will be interesting to see the role women play in the world this week. Venus in Cancer will be activating outer planets. The outer planets (Saturn though Pluto) represent long-term evolution and focus. Jupiter contributes to these things too, but only stays in a sign for one year, so the focus with Jupiter shifts more quickly. Venus often represents women, though not always and not exclusively. Venus represents values, wealth, relationship and beauty, too. In Cancer, these qualities are bound to the home, or family, or the places we create for nurturance. Sometimes Cancer represents nationalism and sometimes our emotional responses. Venus opposes Pluto in Capricorn first. Oppositions can feel like confrontations. Notice the desire to protect what is dear to you. We feel threatened. Under stress, we may not make the best choices. However, the Venus transits this week may represent how we have reached the end of our ropes. There isn’t any more to give. This may be an authentic state that helps us move forward or it might be a reactionary response we regret later. With the Moon in Gemini and Mercury moving retrograde in Virgo, things can go awry quickly. Be discerning and careful. Wednesday, August 16. It is so clichéd, but if Venus sometimes represents women, then Mars sometimes represents men. (See yesterday’s post for Venus forecast). Of course, life is way more deliciously complex than a simple binary view of gender, thank goodness, but the contrast between Venus transits and Mars transits this week present different approaches. Mars uses aggression. Venus uses harmony. Yet, either planet, when it needs to, will use other tactics. It depends on sign and relationship to other planets. Yesterday, Venus in Cancer opposed Pluto in Capricorn. Today, Mars in Leo makes a quincunx to Pluto. Pluto brings struggles with toxic power. Under this influence we may notice more macho posturing, a need to prove one’s power and might. Because the world is tense right now, these transits may trigger new reactions. We can also commit to being the grounded and calming influence in stressful situations. The Moon in Gemini supports communication. Can we talk someone down from difficult places? The Moon makes a trine to Jupiter in Libra, which further encourages balanced exchanges of ideas. Remember your core values. It matters how we respond to injustice. Responsibility increases as the day progresses. The Moon opposes Saturn in Sagittarius adding to frustrations about differing beliefs and the work we have to do to build bridges. Thursday, August 17. I, along with thousands of others, was inspired by Rep. Maxine Waters reclaiming her time when questioning Treasury Secretary Mnuchin in a hearing last month. We might all want to reclaim our time today as Venus in Cancer makes a square to Jupiter in Libra. Venus likes order, harmony, and effectiveness. Venus doesn’t do well with entitlement, obfuscation, and waste. Jupiter reveals a distinct lack of balance and harmony at the moment and many of us are feeling done with that. The Moon moving into Cancer could reveal the fighting side of this nurturing sign. If we are angry, it is because others more vulnerable than we are need protection. August 18—Balsamic Moon: Composting. Eclipses are about the relationship between light and dark. This is a symbiotic relationship. Each essentially needs the other to exist. The sudden darkening of the Moon or Sun in an eclipse reminds us of this dance. Shadows and light have been very active in this lunar cycle that culminated with a lunar eclipse and leads up to a solar eclipse at the next New Moon. Eclipses happen every six months—they are part of the natural order—yet this eclipse season seems more fraught and more potent. Leo, the sign of this and the next lunar cycle has a way of bringing up core experiences. The Sun, ruler of Leo, is the giver of life. Does it feel, when the Sun is eclipsed, that this source is threatened? Are we plunged into fear and reactivity? There is another way to look at this. The last phase of every lunar cycle encourages letting go and composting. Although the Moon returning to darkness may feel like a loss, this necessary stage of release allows for the next cycle’s rebirth. We need the dark. We need the emptiness, too. An eclipse is a potent moment of release and rebirth. The Moon teaches us about cycles and how to move through life in alignment. The Moon in Cancer today, the sign of the Moon’s rulership, invites that awareness to move through us. Ancestral wisdom is speaking to us. Venus in Cancer continues to aspect outer planets. This time, Venus makes a quincunx aspect to Saturn in Sagittarius. If Saturn’s transit through Sagittarius has taught us about the impact of our truths, the dangers of mistruths, the divisions between people of differing beliefs, and the perils of narrow-mindedness, then Venus says: What are you going to do about it? Venus right now is the fed-up mistress of the home. There is nothing meek or mild about her position in Cancer. Without home base, we lose power. Strengthen your base and demand that family members clean up their messes. Because the Moon and Venus are conjoined in Cancer, they pair up to activate the influential square between Pluto in Capricorn and Jupiter in Libra. At Charlottesville last weekend, one pastor prayed in gratitude that the hate that had always been there was finally exposed, because only when we see the hate, can it be transformed. This is the action of Jupiter square Pluto. We can only change what we acknowledge. There is work to do here. Saturday, August 19. For the next two days the dark of the Moon provides opportunity to reflect and release. The Moon re-enters Leo reminding us of the beginning of this lunar cycle (began on July 23) and giving more information about the seeds we wish to plant in the next lunar cycle that begins on August 21. This next New Moon will also be in Leo and is a total solar eclipse. Early in the day, while still in Cancer, the Moon makes an agitating square to Uranus in Aries. The theme of Uranus is a call to wake up. How are you called to wake up? This wake up call ranges from the need to make big life changes to the simplicity of being more present in your life. Wake up and wonder. What is next for you? Sunday, August 20. Don’t forget that Mercury is still retrograde if you find yourself traveling to a location to observe tomorrow’s total solar eclipse. Mercury in Virgo encourages us to slow down, go over the details more than once, and to be adaptable when things don’t work out according to plan. Perhaps there is a bigger plan at play. Mars in Leo, a star of this lunar cycle, makes a sextile to Jupiter in Libra. This beneficial influence actually may counterbalance any Mercury shenanigans that challenge us today. Pay attention to energy, life force, what brings joy. Then notice what happens when you pass that along to someone else. There is no easier way to see energy than to see someone else light up because we were generous with our time, attention, or resources. This is Leo magic. The Sun in Leo makes a quincunx aspect to Chiron in Pisces. We get to incorporate more selflessness into a “selfish” desire to feel joy. By this I mean, don’t hoard your happiness. Practice radical trust that there is enough, always enough, to go around. Not every act is conscious. Not every breakthrough comes deliberately. Things happen to us. Sometimes we aren’t aware of our choices. Sometimes we don’t have a plan. This actually makes sense when you think about the intricacies of the web that links everything. Consciousness alone is insufficient to understand it. How could I possibly see every influence and option in any given moment? No, intentional living isn’t about consciousness alone. There is more to it. Perhaps that more is about finding connection. And perhaps remembering connection is about the body more than about the mind. With this Full Moon in Leo, we arrive at the eclipse season. August 7 is a lunar eclipse. The following New Moon on August 21 will be the much anticipated, so-called “Great American Eclipse.” I am thinking about conscious choice right now because eclipses play around the edge between the unexpected, uncontrollable things that just happen to us and the potentiality of conscious choice. When the light goes out suddenly, it seems we have a moment, outside the norm, to re-vision choices and re-connect to the whole. Lately, I’ve come to think that interconnectivity is what Mystery is. Mystery being the sense that there is more than we can know, which co-exists with the things we think we do know. The dark is a great metaphor for Mystery. Eclipses are great moments for magic. The August 7 Full Moon is full of magic. Because we get two Leo lunar cycles in a row this year, our current lunar cycle is a perfect set up to plant seeds of intention for the New Moon/Solar Eclipse of August 21. I am visualizing that the total solar eclipse is an opportunity to compost in the darkness things that feel isolating to us. Ego is a Leo concern. Good-sized ego helps us to be in relationship and share our gifts. Out-of-whack ego tells a story of isolation and scarcity that I am working to turn around in my life. For me, the wonder of the total solar eclipse is the idea that at totality, in the darkness, we are able to see more. At totality, the stars and planets normally obscured by the glare of the Sun are visible. The planets we will see clustered near the Sun will be Mars, Mercury, and Venus. The magic I wish to activate is that this solar eclipse will reveal hidden strands of interconnection—things we don’t normally see—connections that are there but hard to feel all the time. I am feeding the intention that through darkness I see our complex interconnections and find my right-size relationship to the pieces and the whole. August 7—Full Moon: Blossoming. Lunar Eclipse. Astronomical Lammas. An eclipse of the Moon has a different flavor than a solar eclipse. Since the Moon rules the unconscious, the effects of a lunar eclipse have a more subtle impact. Emotionally, we may sense that “something is up,” but not know exactly what it is. Since a lunar eclipse always happens at a Full Moon, the emotional tides are high anyway. These high tides could wash away your shoreline or could reinvigorate your tidal pools. Movement is happening, especially as this eclipse leads to a solar eclipse in the next lunar cycle. The Moon in Aquarius, fixed air sign, does its best to avoid large emotional displays. This sign is more comfortable with ideas and analysis. If that is your method of handling emotion, then this Full Moon’s tides may sweep you out of your comfort zone. But that isn’t the only option. These tides may reinvigorate Aquarian vision and purpose. This is big picture vision. This is the inspiration of seeing connections as patterns and possibilities. Aquarius, as the sign opposite Leo, provides balance to Leo perspective. If we are feeling isolated, unappreciated or hungry for affirmation, the Aquarius Moon invites us to look at the patterns and possibilities of mysterious connections. Opposite signs also invite paradox. This paradox may be that we see better our own gifts and value when we let go of the personal and move into the collective. This Full Moon happens on the day that the Sun reaches the mid-point in Leo, known to some as astronomical Lammas. This cross-quarter Pagan Sabbath is about celebrating our first harvests and the gifts we have to share. This is the first cross-quarter Sabbath since we celebrated Beltane in May. The Earth’s fertility has yielded many blessings. Gratitude and reconnection to the gifts from the Earth also help to know right-sizedness in ourselves. What has grown in you? What are you ready to offer up to the world? How are you expressing gratitude even on the smallest level? With this as a backdrop, Mars makes an impact on this Full Moon. Mars in Leo conjoins the Sun. Only four degrees separate the Sun and Mars right now. Mars adds drive and passion to the Leo storyline. Mars gives us courage to be wholehearted. Mars dares us to ask if we matter. Mars encourages generosity. Mars fights for the creative gifts each person contributes to this world. And, if you are in doubt of your own gifts, Mars encourages us to look again. What will the darkness of this lunar eclipse reveal to you? Tuesday, August 8. Large forces are moving through our lives. Yesterday’s Full Moon lunar eclipse may have brought hide tides of emotion. Yet, you might also be feeling the exhilaration of new insights and inspirations. The Aquarius Moon is looking for the patterns that explain it all. What patterns were revealed to you? The day starts buoyantly. The only aspect the Moon makes is an encouraging sextile to Uranus, the co-ruler of Aquarius. The big guy in the sky seems to be giving the OK to our grand dreams. This energy is fleeting. When the Moon enters Pisces later, we might experience some deflation. Breathe with it. This is part of the rhythm of change too. Wednesday, August 9. The last few days have offered high levels of air and fire energies. The Moon in mutable water sign, Pisces, provides quite a contrast. It might feel as if your bubble has burst. Or it might feel like you’ve returned to a proper sense of things. If you are the intuitive type, you may be noticing that people are ungrounded or confused about the shift. If the Full Moon served to expand what we know about ourselves, then the Pisces Moon helps us connect back to our hearts. We are all afloat on the sea of becoming. The Moon’s trine to Venus in Cancer reinforces a need to nurture and heal. The Moon conjoins Neptune, expanding into vaster connections while at the same time opposing pragmatic Mercury in Virgo. Mercury is about to turn retrograde on August 12. There could be a sense of urgently needing to get back to order and routine even as it slips farther away. The quincunx aspect between the Sun in Leo and Pluto in Capricorn could unleash a crisis of Self. What are the root causes of feeling unappreciated? What destructive forces are let loose when we don’t know how to meet these needs? We may see another level of narcissism in our leaders. Thursday, August 10. Dreams take work. It isn’t enough to want it. We also need to support the dream with effort and willingness. Jupiter in Libra forms a sextile to the Sun in Leo today. Opportunity is knocking. Pathways are opening. It feels like things are falling into place. But luck alone won’t suffice. With the Moon in Pisces making a square to stationary Saturn in Sagittarius, we are challenged to find the perfect blend of dream, effort, and opportunity. Another sextile aspect between Mercury in Virgo and Venus in Cancer helps productivity. Notice a strong desire to tidy the home. Clearing our environments aids progress. We value the relationships that feel familial. Another influence may bring some confusion if we aren’t sure of where we want to go. Mars in Leo makes a quincunx aspect to Neptune in Pisces. Intuition plays a role in the unfolding story of this lunar cycle. What feels right? It may not make perfect sense, but take a chance anyway. August 11—Disseminating Moon: Fruiting. Breaking free of cultural norms around asking for what we need, especially around needing recognition, is a tough challenge. Yet, we need this energy to thrive. We need it from each other. We need to be witnessed. We need to know we are connected to others and seen for who we are. I think witness is about sharing, passing the gifts back and forth. Can I be seen for what I give you? Can I see you in what you have to give me? The cultural norm, which is really cultural control, is that the resource of witnessing is scarce. There isn’t enough. We have to compete to gain attention. We have to starve before we let ourselves need anyone else. There’s some toxic stuff going down around affirming each other. There’s a lot of pushback when we show the vulnerability it takes to ask for what we need. It is under this awareness that we have the opportunity to resist these toxic norms and dare to reap the fruits of this lunar cycle. I am talking about courage. The Moon in Aries makes no exact aspects today. We just get the Moon in Aries, pure and simple. Aries is the fire sign that dares to leap off the ledge. Sometimes this looks like courage. Sometimes it looks like foolishness. Courage isn’t the feeling that we know what we are doing. Courage is being led by something else, a belief, a dream, a knowing that comes from the heart (that place which gives us the word courage) to go where we need to go. What is your heart dream? What will you give to that dream life? Fire signs are about life force. This is the spark that we share. This is the spark that never diminishes as long as we keep sharing it with each other. One of the gifts I’ve received from this lunar cycle intention is the realization that it is much easier to be right-sized when I know I am connected to others. To know it is OK to ask for what I need and to honestly hear what others need from me. This doesn’t mean I take care of everyone’s needs. It means I am willing to see them, to witness, and to share. To need. Saturday, August 12. Mercury in Virgo stations retrograde. Yes, indeed it is that time again. Mercury rules our curiosity. How curious are you to see what influence Mercury will have during this period, which is heavily colored by eclipses? It could be interesting. The miscues and misunderstandings that happen under Mercury retrograde carry added significance. These things go wrong at other times too, but during retrograde, they seem to mean something, or lead to somewhere that we could not have gotten to under ordinary circumstances. Mercury retrograde can feel like time outside of time. It can feel like an invitation to pay attention in different ways. Give up trying to control the outcomes. Expect the unexpected. Virgo is ruled by Mercury. Perhaps this Mercury retrograde will scrub clean, in the ways only Virgo can, the cobwebs of our minds. Perhaps it will be more challenging. Perhaps it will feel just right. The day that Mercury stations can be jittery. Take your time today as the Moon also sets off the square between Pluto in Capricorn and Jupiter in Libra. Pluto/Jupiter influence has been about showing the darker sides of power, stirring up imbalance and injustices. Purging ugliness. Transforming belief. In other words, this transit has been a powerful influence recently and we aren’t done yet. Today brings another permutation. Sunday, August 13. Yesterday had wrinkles. Mercury retrograde began. The Moon set off Pluto and Jupiter. Late last night (technically today in CDT), the Moon conjoined Uranus in Aries, which has not helped iron out any of the wrinkles. Bumps in the road woke us up. Don’t sleepwalk through this day either, even though things will calm down a bit with the Moon moving into Taurus. Earthy influence helps ground us as long as we let the earth support us. Slow down. Sense into your body. The Sun in fiery Leo makes a trine to Saturn in mutable fire, Sagittarius. Although these are fire signs, Saturn’s influence still feels like earth—the committed and serious side of earth. Saturn will soon station direct and begin a relatively quick journey out of Sagittarius to enter Capricorn in December. This blessing of the Sun encourages us to look at the benefits that have come from Saturn’s travels through Sagittarius. Saturn first entered this sign in December 2014. Sagittarian Sun signs may have particularly noticed how serious life got during this time. But looking back over the last 2 ½ years, what can you say you have gained from your efforts? Saturn in this sign influences how we perceive truth, what we think about other cultures, our responsibilities around what we believe. Saturn has shown us clear divisions and the impact that such divisions has on the world. There is work to do with this information.